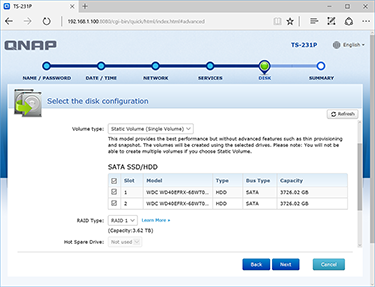 Picking a network-attached storage solution can be tricky simply because there's so much choice. 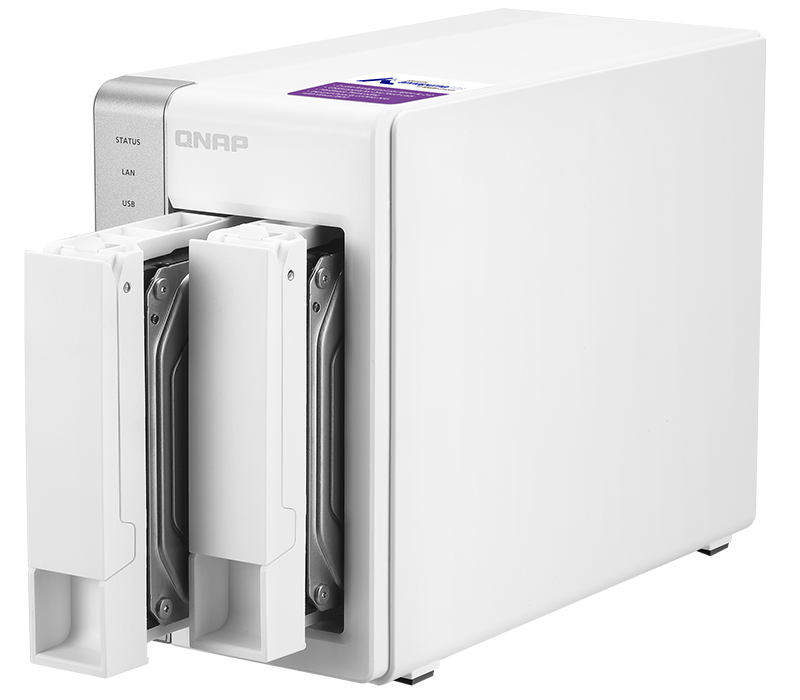 Qnap, one of a handful of well regarded vendors, already has an enormous catalogue to choose from and new models are arriving thick and fast. For the typical home user seeking sage buying advice, our recommendation would be to spend somewhere in the region of £100-£200 on a dual-bay unit with a reliable and well-known operating system. 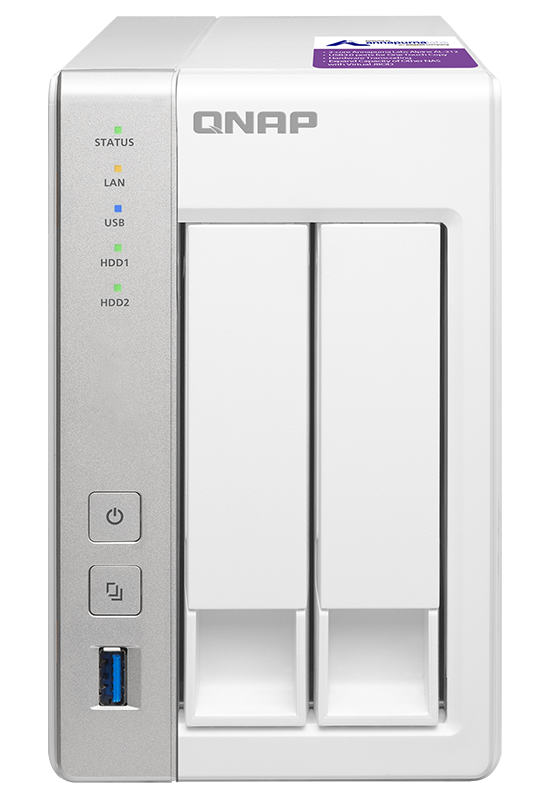 Fitting into the upper end of that price bracket, Qnap's TS-231P, at £180, seems a viable option and goes up against the likes of the Synology DS216play as a potent centralised storage server for the modern home. In keeping with an industry-wide trend, white is the in colour for home devices, while black has been reserved for business. 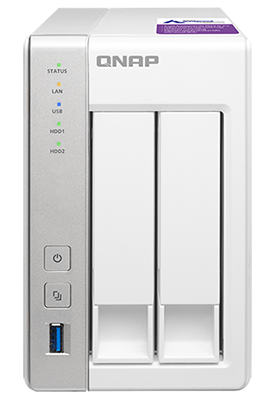 Qnap's chassis takes a familiar form factor, measuring 169mm x 102mm x 219mm in size, but the matte-white finish and silver trim allow it to blend easily into a home environment. It wouldn't look out of place on a bookshelf, and given the capacity available to today's hard disks, two available drive bays should provide plenty of storage space. Keeping things simple, the front of the unit is home to a neat column of status LEDs, a backlit power button and a USB 3.0 port with one-touch copy. 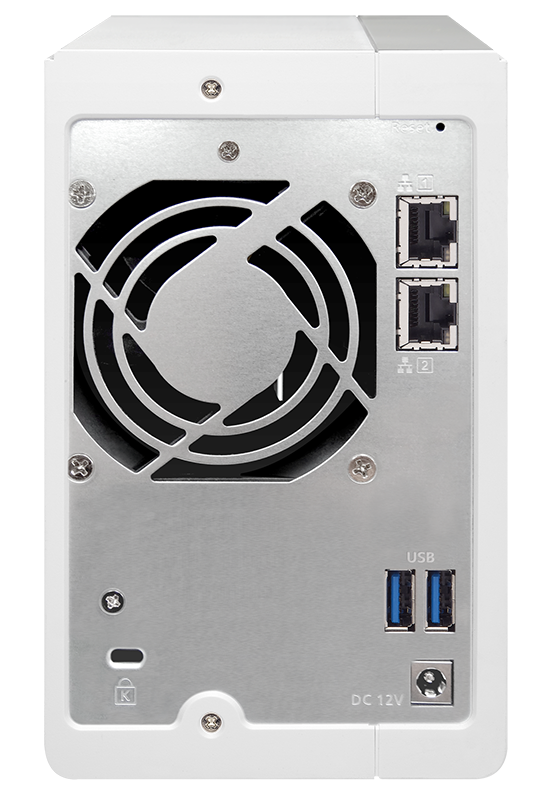 The bulk of the connectivity takes place around back, where you'll find dual Gigabit Ethernet ports offering link aggregation, a further two USB 3.0 ports, a connector for the external 65W power adapter and a single 70mm fan tasked with cooling the entire device. 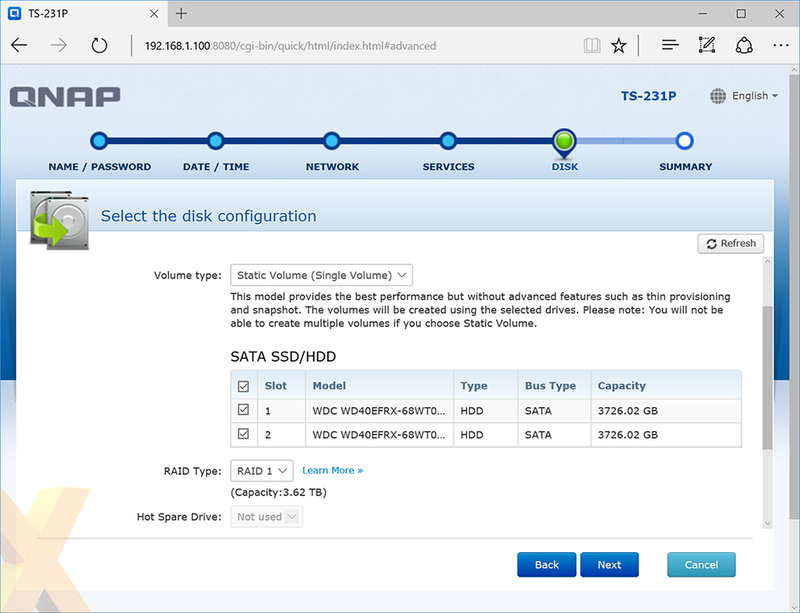 Both drive trays are of the basic, plastic variety, and they aren't tool free, though we doubt the target audience will be planning on hot-swapping disks on a regular basis. 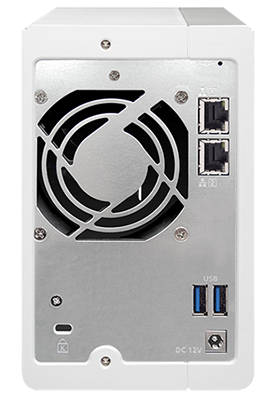 It's a tidy-looking box that you should be able to configure once and then forget about, however you do miss out on some advanced features available to pricier models. There's no HDMI output for direct-to-TV multimedia playback, no SD card and no IR receiver for remote control support. Is the lack of HDMI a big miss on a home-user device? Perhaps not, as smart TVs and dongles such as the Amazon Fire have made it easy to get network content on the big screen. 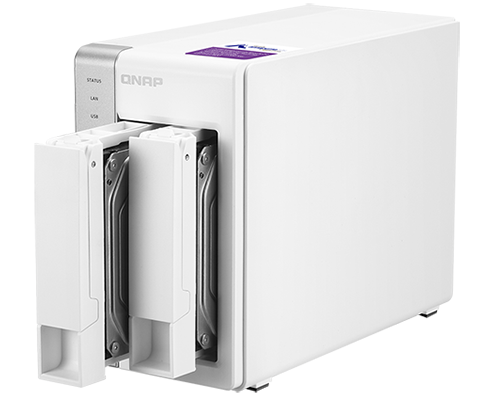 Under the hood, a dual-core 1.7GHz Alpine AL-212 processor and 1GB of soldered DDR3 memory continues the mid-range theme, though Qnap reckons the hardware is sufficient to deliver sequential throughput of up to 224MB/s read and 176MB/s write. But choosing a NAS based on hardware, appearance or connectivity would be folly. 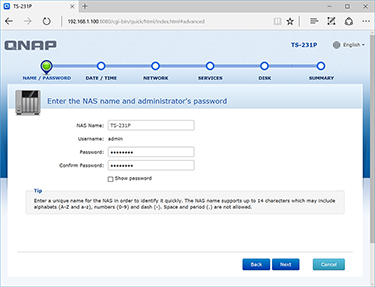 It's ultimately the operating system that makes one unit stand out over another, and Qnap has the edge over many competitors with its robust, feature-packed and frequently updated QTS software. 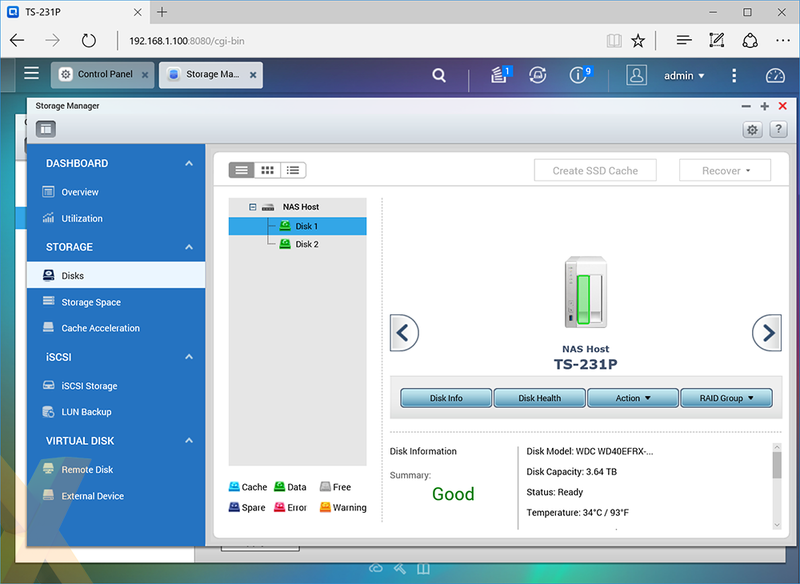 The user experience is up there alongside Synology's DSM, and the array of functions are equally accessible to both novices and experts alike. 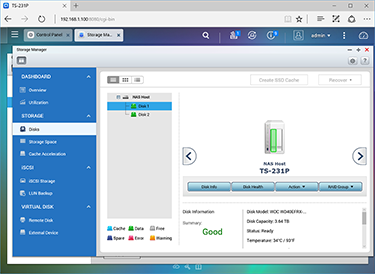 A web-based setup wizard makes light work the initial configuration, with the user able to easily set a server name and RAID disk array, while the latest available firmware is downloaded and installed before the process is complete. The entire box can be setup within a matter of minutes and the user is then dropped into an inviting home screen that borrows a Windows-like taskbar and iOS-like tiles to create a familiar interface well suited to multi-tasking. The QTS feature set is about as comprehensive as it comes, and the TS-231P offers most of the essentials that matter to home users. 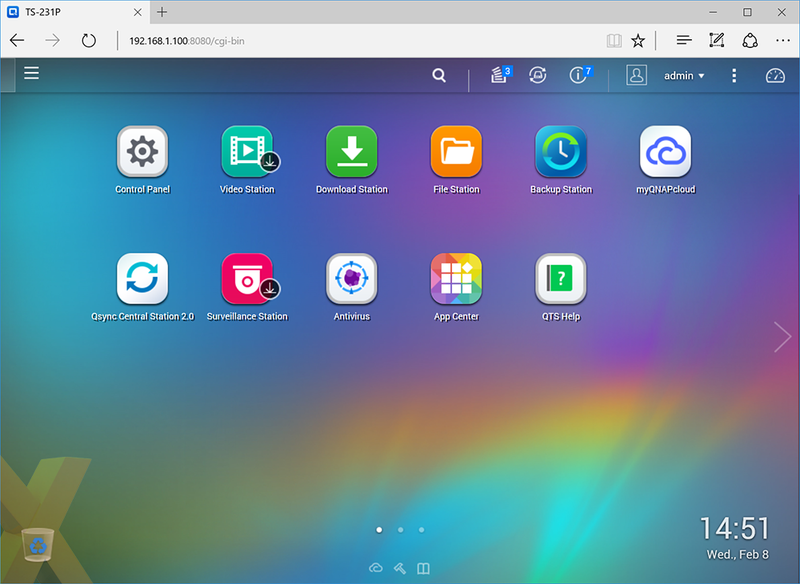 Centralised file storage is made easy, as are multiple user accounts, backup options are plentiful, and all the usual goodies - download station, a DLNA media server and Plex - are available via the App Center. One limitation to be aware of, however, is that the ARM-based processor won't offer hardware transcoding in third-party apps such as Plex. For that level of prowess you'll need to consider stepping up in price to an Intel-based unit such as the TS-251A. This isn't going to be Qnap's quickest dual-bay box, but for £180 the TS-231P should offer a combination of speed and efficiency that's well suited to the home or small office. Let's see if our benchmarks concur.